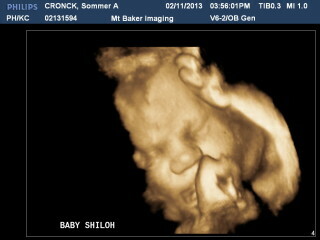 Today I am 34w5d and had one last ultrasound to check on Shiloh’s position, fluid and get an estimated weight. She’s head down, fluid is good (abundant, even) and her estimated weight was 6 pounds 1 ounce! Of course that can be off by a pound either way, but based on how big the others were, it’s probably about right. She even switched the machine over to 3D for a minute and we got another peek at the little Miss. She’s a chubby little thing! Ive got a busy work week this week, and I’m in a wedding on Saturday, but after that… I’m feeling ready. If she is ready, she’s welcome to come any time after Saturday! OMG, she looks just like her Daddy! Even the same hairline – lol!! She does look quite a bit like Skip and Nate. But that’s not her hairline – that’s just shadowing on the ultrasound. She has hair, but not a lot, according to the tech. I had hoped she’d finally be the one born with a mop like I was, but no such luck, apparently!